Nowadays most people base their HEALTH just on the way that they FEEL but at Pure Wellness we base your HEALTH on your PHYSIOLOGY because physiology doesn't lie. Unfortunately most people that have a heart attack or a stroke don't feel their arteries clogging up before hand the heart attack or stroke is the first symptom they experience. When the body processes sugar glucose in the bloodstream naturally attaches to haemoglobin and becomes “glycated”. The amount of glucose that combines with this protein is directly proportional to the total amount of sugar that is in your system at that time. HbA1c correlates with both heart disease (stroke and heart attack) and diabetes and its complications. You should have an HbA1c below 6%. Simply take you Triglycerides and divide them by you HDL cholesterol. Your Triglyceride/HDL ratio helps to offer a lifelong metric for your health . TG:HDL is one of the criteria fort he diagnosis of metabolic syndrome. Research has shown it to be 17 x’s more accurate at predicting adverse cardiovascular events such as heart attack and strokes , Having a TG:HDL ratio below 3 is what you should shoot for. How much lean muscle you have vs. how much body fat you have and WHERE you are storing fat is one of the #1 predictors of longevity. People with the most body fat , more than 35% fat for me and 38% fat for women are most likely to die within a few years , regardless of weight and BMI. Keeping lots of lean muscle and little visceral (organ) fat is sure way to live a long, healthy life. For every inch your head moves forward, it gains 10 pounds in weight and results in up to 30% decrease in vital lung capacity (your ability to breathe deeply). A recent study found that forward head posture was associated with a 1.44 increased rate of mortality. Your posture determines your ability to move properly and movement, as we age, is critical to almost every function in your body. 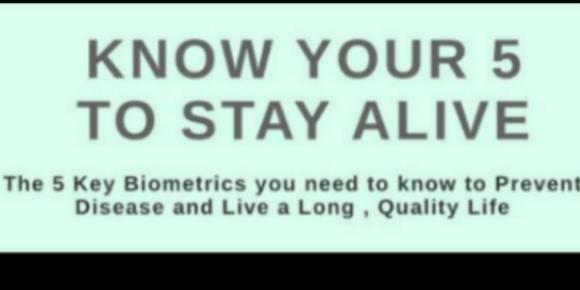 Find out your 5 Key biometrics Plus 20 more with the Wellness Score . The Wellness Score allows you to assess what areas of your health you are doing really well at and what areas of your health might need some work and the great news about the score is that every single number on there can improve and if you need it we can offer you the guidance , support and resources to do that.